A new Hubble Space Telescope image of a celestial object called the Ant Nebula may shed new light on the future demise of our Sun. The image is available at http://hubblesite.org/newscenter/archive/releases/2001/05/image/a/. 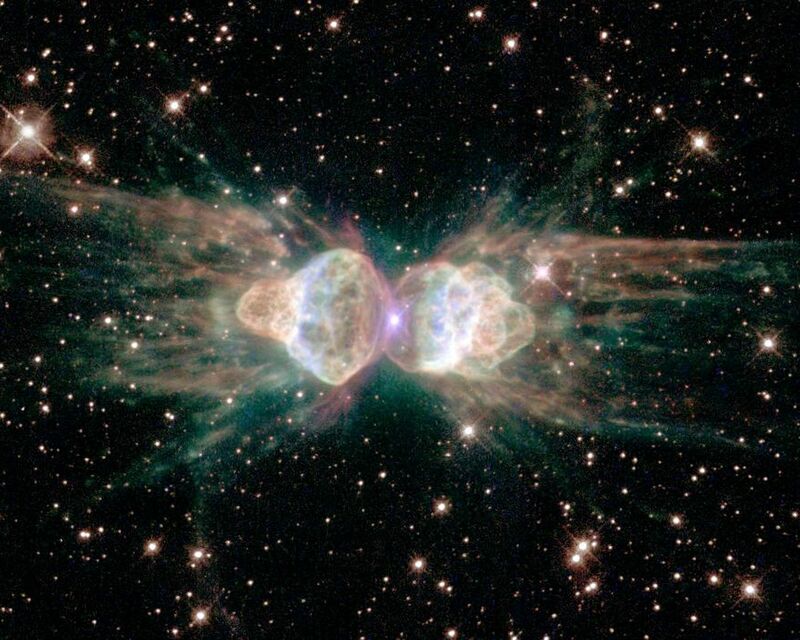 The nebula, imaged on July 20, 1997, and June 30, 1998, by Hubble's Wide Field and Planetary Camera 2, was observed by Drs. Raghvendra Sahai and John Trauger of NASA's Jet Propulsion Laboratory, Pasadena, Calif.; Bruce Balick of the University of Washington in Seattle; and Vincent Icke of Leiden University in the Netherlands. JPL designed and built the camera. 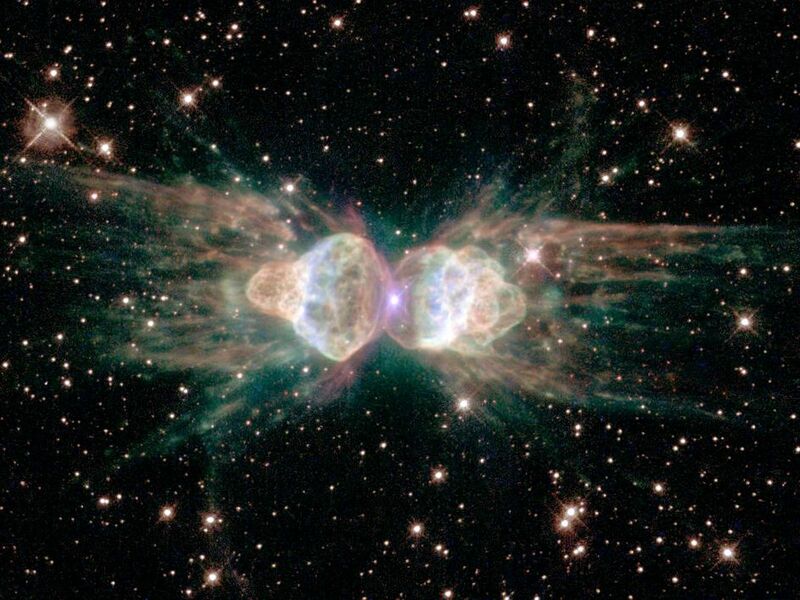 The Ant Nebula, whose technical name is Mz3, resembles the head and thorax of an ant when observed with ground-based telescopes. The new Hubble image, with 10 times the resolution revealing 100 times more detail, shows the "ant's" body as a pair of fiery lobes protruding from a dying, Sun- like star. 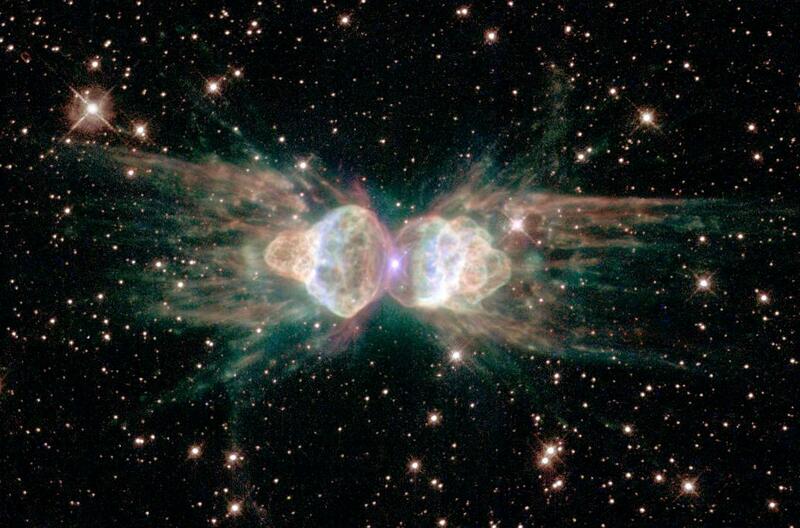 The Ant Nebula is located between 3,000 and 6,000 light years from Earth in the southern constellation Norma. The image challenges old ideas about what happens to dying stars. This observation, along with other pictures of various remnants of dying stars called planetary nebulae, shows that our Sun's fate will probably be much more interesting, complex and dramatic than astronomers previously believed. 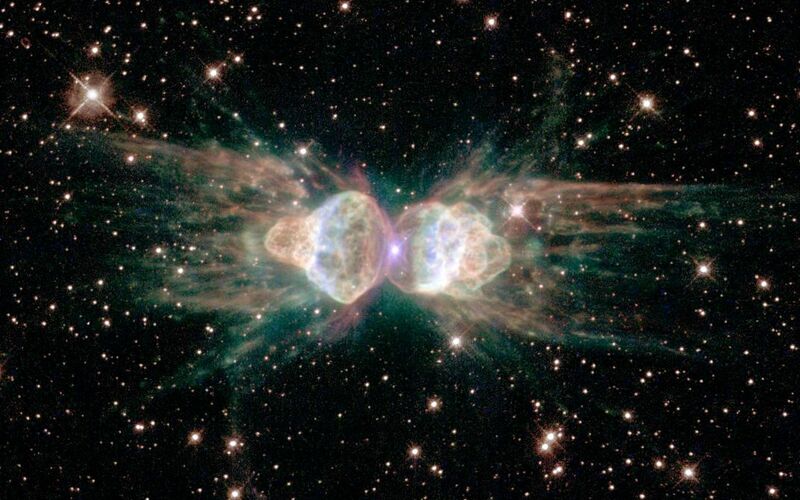 Although the ejection of gas from the dying star in the Ant Nebula is violent, it does not show the chaos one might expect from an ordinary explosion, but instead shows symmetrical patterns. One possibility is that the central star has a closely orbiting companion whose gravitational tidal forces shape the outflowing gas. A second possibility is that as the dying star spins, its strong magnetic fields are wound up into complex shapes like spaghetti in an eggbeater. Electrically charged winds, much like those in our Sun's solar wind but millions of times denser and moving at speeds up to 1,000 kilometers per second (more than 600 miles per second) from the star, follow the twisted field lines on their way out into space. The Space Telescope Science Institute, Baltimore, Md., manages space operations for the Hubble Space Telescope for NASA's Office of Space Science, Washington, D.C. The Institute is operated by the Association of Universities for Research in Astronomy, Inc., for NASA under contract with NASA's Goddard Space Flight Center, Greenbelt, Md. The Hubble Space Telescope is a project of international cooperation between NASA and the European Space Agency. JPL is a division of the California Institute of Technology in Pasadena. Additional information about the Hubble Space Telescope is available athttp://www.stsci.edu/hst/. More information about the Wide Field and Planetary Camera 2 is available at http://www.stsci.edu/hst/wfpc2.